Hearty but healthy, with smoky spice and robust flavor. Bonus - have it on the table in 30 minutes! Quick Easy Chipotle Turkey Chili is a hearty but healthy chili recipe packed with the perfect level of smoky spice and a deep, rich flavor. And bonus – you can have it on the table in 30 minutes, or let it simmer all day, chill out in the fridge overnight, or save it for later in the freezer! Now, as amazing as those million-ingredient, slow-simmering chili recipes taste, sometimes you just want chili NOW. Like, on a Tuesday night, after you’ve worked/chased kids/walked dogs/fought traffic/monitored all of your social media accounts (oh wait, that’s just us bloggy-types) all day. 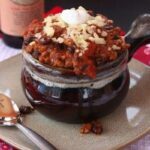 You need a chili recipe that has a deep, well-developed flavor without needing all of that time. And you want it a little healthier too, right? By using turkey, but enhancing it and bringing that rich smokiness from a combination of beef broth or stock and chipotles in adobo, you get that cooked all day flavor, but you can have it on the table in no time. The beef broth truly adds a meaty dimension to this Chipotle Turkey Chili, but I did find without cooking it for a long time, it was a little liquidy until it sat in the fridge overnight. So rather than cutting out the broth, I am going to recommend draining the tomatoes, unless you prefer a thinner consistency or are making it a day or so in advance. But you know what, whatever – it tastes AWESOME! We all devoured it. Even the littlest one! 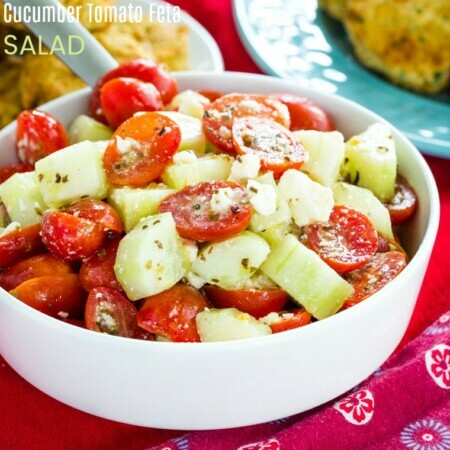 I am so grateful to Kara for a great recipe that was a perfect starting point. Just a few tweaks based on what I had and some personal preferences, and this may now be my go-to for when I don’t want to make an entire vat or chili, which is what my other favorite recipe produces. cheese sour cream (or plain Greek yogurt), tortilla chips, or your favorite chili fixin's for serving. Heat olive oil in a pot over medium heat. Add the onion, season with a pinch of salt and pepper, and saute for 3-5 minutes, or until it starts to soften and turn translucent. Add the turkey and cook until it is browned and cooked through, breaking up as it cooks. Add the chipotles, adobo sauce, chili powder, cumin, tomatoes, tomato sauce, broth, and beans. Stir, bring to a simmer and cook uncovered for 15-20 minutes (or longer if desired), or until heated through and slightly thickened. Season to taste with salt and pepper. 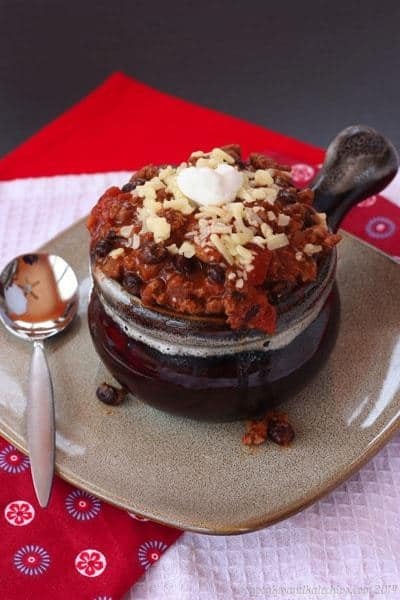 Serve with your favorite chili fixin's. Totally trying not to drool all over my keyboard. This chili looks crazy good! I’d love for you to come link up at my Simple Supper Tuesday linky party. Thanks Cindy! It was awesome. Thawing some leftovers for taco salads this week! Love the crock you used – so pretty! 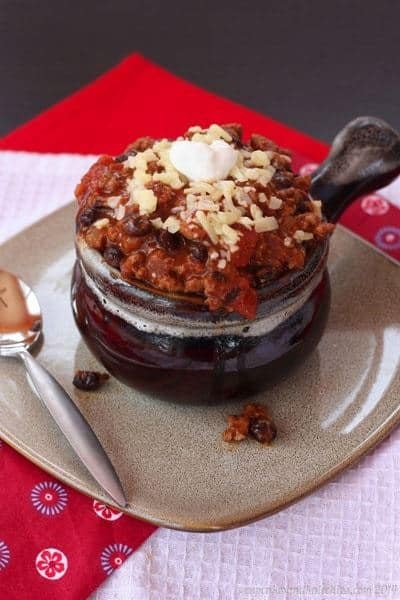 It’s so great to have a quick n easy chili option that’s full of flavor! Thanks for sharing Brianne! I agree! Love the slow cooked stuff, but sometimes I want it fast! Sounds like the perfect quick and easy Turkey Chili. I love the addition of the smoky chipotle pepper, Brianne! It’s not an ingredient I can find here usually, so I bring back a couple of cans from home when I am in the States. One has now been earmarked for this lovely chili! Chipotle does add such unique flavor! And good thing the cans are small and light for easy transport! CAREFUL!!! The ‘vote’ button is ABOVE the one you like-not below as one would;d normally expect. I really prefer yours because it makes good use of that ground turkey that I got real cheap AND it uses black beans. I LOVE black turtle beans! Yes! I realized that! Thanks, it is an economical and fast dish! Quick and easy but slow cooked taste-perfect. 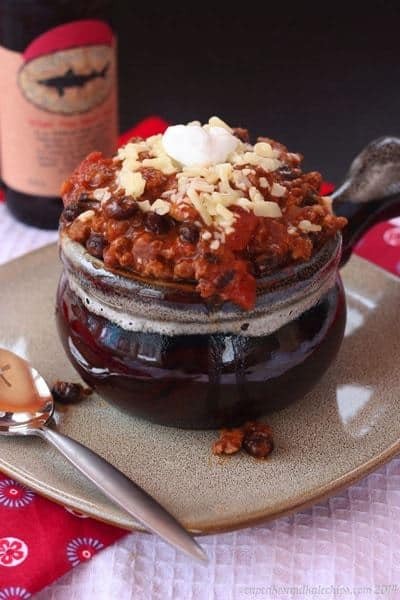 You are so right, sometimes you just need chili, now! I love how quick and simple this is! I do always associate chili as something that cooks for hours. Wonderful to find a chili that has all the flavour but not as much time effort. I love long-cooked chili, too, but using the right ingredients still gives it so much flavor. Love the Chipotle! I can taste this already! I just want to dig right into this bowl of chili! 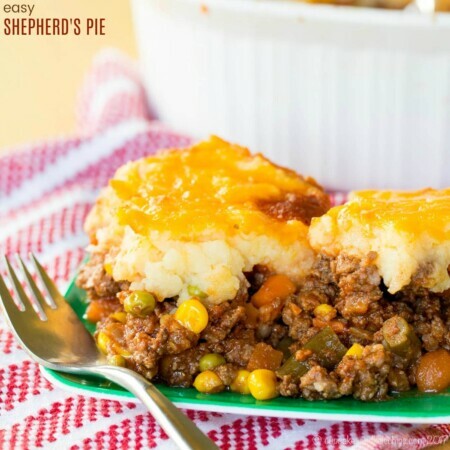 It looks so hearty, and I love that it is quick and easy to make! It’s all about those chipotles that give such an awesome flavor! I love the tip about using beef broth with the turkey – I probably wouldn’t have done that. I really want to know what bottle of wine you have behind your bowl of chili – it has a shark on it? I give my friend the credit for the beef broth, and that is Dogfish Head beer! Aaahhh Brianne, that first picture is AMAZING! I so wish I could pick up the little chili that fell off the bowl… ahhhh! YUM! Thanks! Somtimes I like my food to be plated neatly, but sometimes those little spills make it look even tastier! I love chipotle in my chili, too. This looks quite scrumptious! I love that it adds depth and smokiness with the heat! I want to pretend I’d be all healthy with this but truth be told it looks like it would be amazing on top of french fries and dalloped with sour cream. Get in my belly! I love chipotle anything, so this looks fab to me. I’m gutted I didn’t join in this week! Chipotle does add great flavor! Chipotles are always a good way to go! Stunning looking chili, I could dive right in!!! Oh my gosh your post made me laugh! Thanks for that and Love Ya too!! Wow! that is one big bowl of lovliness! This is just perfect! Love the chipotle flavoring! 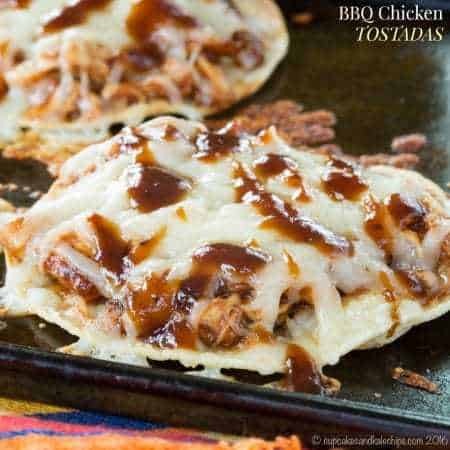 ok, this is the second recipe using chipotles in adobo. . I’ve got to try this!!! It’s and easy way to add a nice, deep, smoky flavor without long cooking. 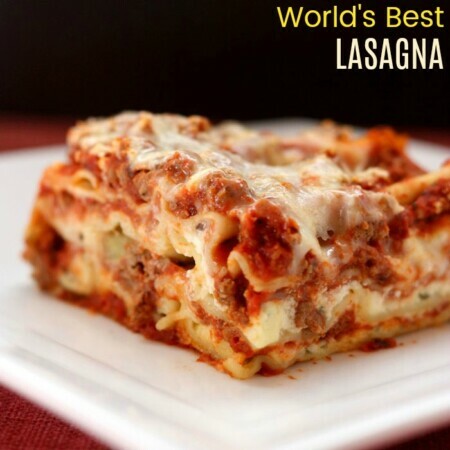 I’m all for quick and easy…especially when the recipe pops a magnificent boost of flavor! Well done, Brianne! Thanks Liz. Sometimes you want a weeknight chili! You totally made me smile when I saw your FB Post right after the event was announced. This chili recipe looks amazing. Good Luck! I’m so glad I asked. It means I had this recipe done before I was sick all week. I might not have been able to get one ready if I waited.